As streaming services offered by Netflix and iTunes and other companies are gaining popularity, the sales of Blu-ray started to drop. But still a lot of people are buying Blu-ray discs because Blu-ray is still of the highest quality. The video and audio qualities are better on Blu-ray and that’s the dominating advantage it has over streaming services. 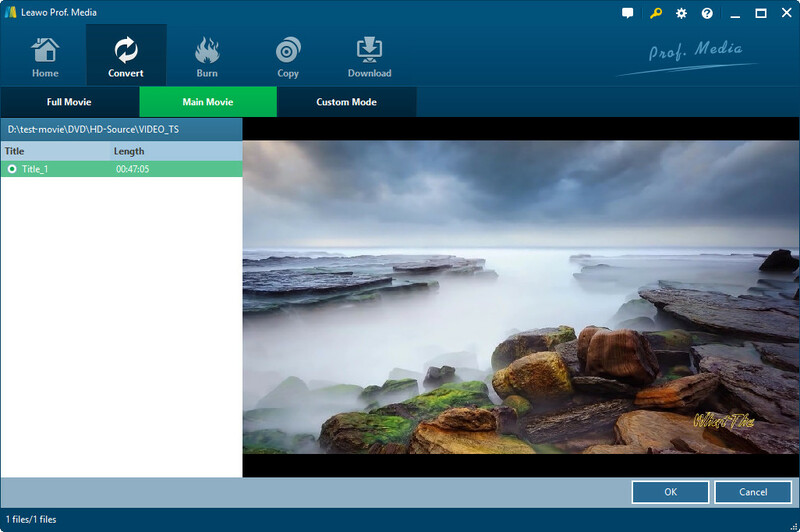 Leawo Blu-ray Copy is a powerful piece of Blu-ray decrypter software from Leawo, a leading multimedia software developer. It can decrypt and save the Blu-ray disc to your computer as a Blu-ray folder or a Blu-ray ISO image file. One important reason why I recommend it as the first choice for Blu-ray decryption is that it only removes the copy protection when copying the disc content to your computer and the original video and audio data will be directly copied with no compression. That means you will have a copy of your Blu-ray disc that’s exactly like the original disc but with no protection. And then you can use a video player like VLC or Leawo Blu-ray player to open the Blu-ray folder and watch the movie on Blu-ray without needing the original disc every time you want to watch the movie. And it also works with DVDs as well. MakeMKV is a popular Blu-ray decrypter and converter. It can convert a Blu-ray disc with protection to protection-free MKV video. And like Leawo Blu-ray Copy, MakeMKV barely compress the output MKV video. You will get a resulting MKV video that’s just as big and high quality as the original Blu-ray movie in the disc. What’s different from Leawo Blu-ray Copy is that the MKV video you get from MakeMKV can be played on mobile handsets, assuming that you have enough storage space for a 20-40GB video file and your device is powerful enough to handle a high quality video like that. By the way, it also support decrypting DVD discs and if you only use the DVD decrypting service, you don’t have to pay for it, the DVD decrypting feature will remain for free forever according to the information on the program’s official site. Leawo Blu-ray Ripper is similar to MakeMKV. It decrypts and rips Blu-ray discs and converts them to common video formats. 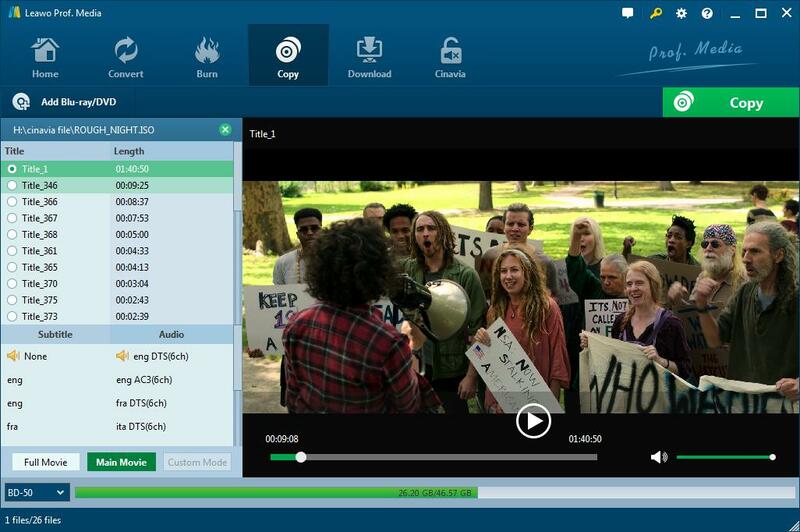 The difference is that it might compress the Blu-ray movie and it offers way more output formats for you to choose than MakeMKV as MakeMKV can only create MKV videos. Some might worry about quality loss due to the compression but the fact is that this Blu-ray decrypter is well developed that it’s able to create a compressed video with high quality. And the output formats and presets this Blu-ray decrypter provides would allow you to create a output video that can be played on your phone or your iPad or any other devices that supports video playback. AnyDVD is a compact piece of Blu-ray decryption software that runs in the background to disable the Blu-ray protection and allow you to access the Blu-ray movie in the disc. With it running in the background, the Blu-ray disc would be readable to all Blu-ray player or Blu-ray backup programs. You can then use a common video player to play the Blu-ray movie or use a Blu-ray backup tool to back up your disc. Here I would show you how Blu-ray decryption software works. I’ll be using Leawo Blu-ray Copy to copy and back up a Blu-ray disc. Here’s how. The download link of the program is provided in below. Step 1. Some software companies like to pack several programs together in the same program in order to serve users better, and Leawo Software is one of those companies. The company had integrated Leawo Blu-ray Copy into a program they called Prof.Media. So when you see Prof.Media on your computer after downloading and installing Leawo Blu-ray Copy, don’t be surprised, you did installed the right program. 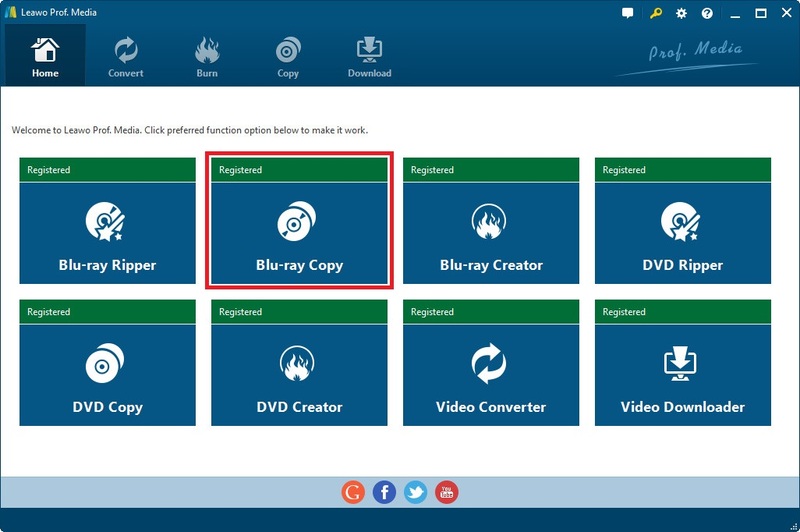 Just open it and choose the Blu-ray Copy tab on it to launch Leawo Blu-ray Copy. Step 2. After getting into the interface of Leawo Blu-ray Copy, the first thing to do is load the disc to the program. Click the Add Blu-ray/DVD button and on the following drop-down menu, choose Add from CD-ROM and import the Blu-ray disc to the program. Remember to put the Blu-ray disc in your Blu-ray drive beforehand. Step 3. The next panel includes detailed Blu-ray copy settings. The first thing you need to decide is which copy mode to use. There are 3 modes available: Full Movie, Main Movie and Custom Mode. You can choose one of them to back up either the whole disc or the main movie only or use Custom Mode to manually choose the titles in the disc to back up. If you use Custom Mode, select the titles, audio tracks and subtitles you want from the respective lists. Step 4. Choose a Blu-ray format you want the backup to be in. You can do BD50 to BD50, BD50 to BD25, BD25 to BD25 backup with the program. Step 5. Click the Copy button above the video preview window. The following sidebar will offer you with 3 different options for backing up your Blu-ray disc. You can back up the disc to your computer as Blu-ray folder or convert it into a Blu-ray ISO or directly copy the disc to another rewritable Blu-ray disc provided that you have two Blu-ray drives connected to your computer. 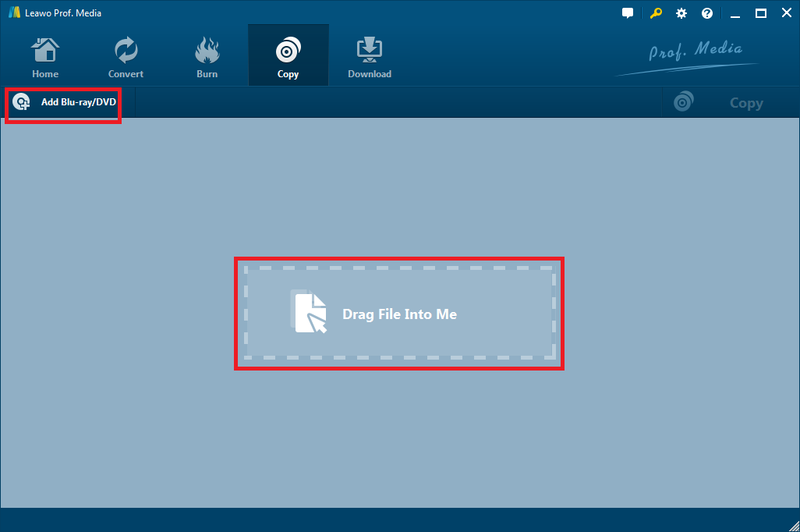 If you have had a Blu-ray folder or Blu-ray ISO image file stored on your hard drive, you can also use this program to copy them to a blank Blu-ray disc. Just check Folder or ISO File according to your needs and set an output path for it. If there’s another Blu-ray drive connected to your computer with a blank disc in it, you can also choose it as the target for the backup. Click Copy at the bottom and the program will start to decrypt and back up your disc. The backups will have no protection and can be used and played by common video players. As one of the best Blu-ray decrypters, Leawo Blu-ray Copy is able to decrypt basically all the Blu-ray discs you can get. Just give it a shot if you are in need of such kind of program.